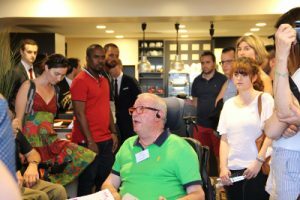 President of the Group for the Insertion of Physically Disabled Persons in Aquitaine, (GIHP) Alain Rousset speaks to us about actions carried out and supported by his association, such as the well-known “Dinner in the Dark” that Tables Vatel Bordeaux organized on Saturday, April 21. Please tell us about the Group for the Insertion of Physically Disabled Persons. We are a not-for-profit Law of 1901 type of association. We have been around for 40 years. Our head office is located in Merignac. We have members with physical and sensorial disabilities. Most members of our Board of Directors are disabled. Our mission consists in facilitating the insertion of disabled people in an everyday environment. By everyday environment, we mean any environment that is not specialized in hosting people suffering from physical disabilities. For instance, at work, we strive to have people working, whenever possible, in a large, medium or small company, rather than in a company for disabled people (ESAT). What other actions are you implementing? With Autonomic Atlantic, we’re organizing a forum with 200 stands and over 1,000 participants. We also work in the autonomy commission in Merignac. Because of our actions, more and more young people are attending middle and high schools. We also want to make the general public more aware of the issues disabled people have. You’re a partner of the Dinner in the Dark that Tables Vatel Bordeaux organized. Why? This event is a part of the Educ Tour organized by Gironde Tourisme in the framework of the Tourism & Disability Month. We’ll also be touring the Vatel **** Hotel as it has a Tourism & Disability label. It’s next to the Tables Vatel Bordeaux. 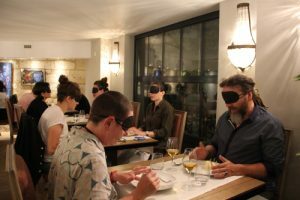 This dinner targets people with no visual impairments who would like to experience the sensations visually impaired persons or blind people have. At the beginning of the dinner, we distributed blindfolds to everyone. The goal was to make people aware of what visually impaired people experience on a daily basis. Is it also to make people aware of how hard it is for blind or visually impaired people to go to a restaurant or go out in general? Yes, of course! Technological progress is improving the everyday life of people suffering from this disability. There is software that makes letters much larger on everything that is written on paper. Braille is disappearing, as less and less people use it. What improvements would you like restaurants to have to better serve people suffering from disabilities? First of all, most professionals, including restaurant owners, must be better informed. I’d like everyone to call us to book a training session on the various types of deficiencies. That way, all their team members would be able to adapt. During this training session, company employees would speak with professionals for the disabled who suffer from troubles mentioned by these specialists. Can you share with us the feelings that a blind or partially blind person has? Alain Rousset is delighted about the actions the GIHP is carrying out as well as the ‘Tables Vatel’s’ actions. He would like all professionals to be trained to better serve persons suffering from disabilities in restaurants or at hotels.